Power Manager can automatically log out inactive users. Being able to log out inactive users is great for use in school computer labs and in situations where computers are shared. 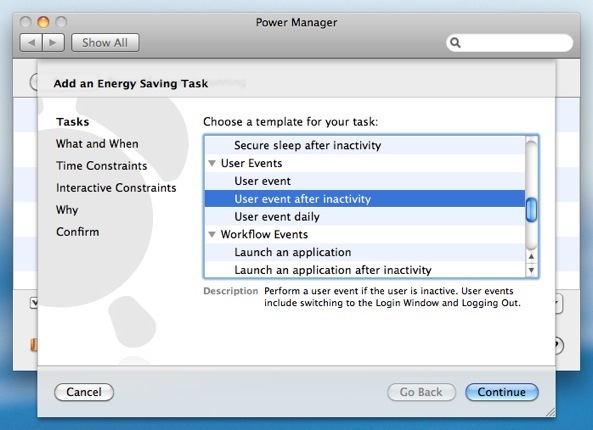 By automatically logging out an inactive user, the Mac becomes available for the next person to use. 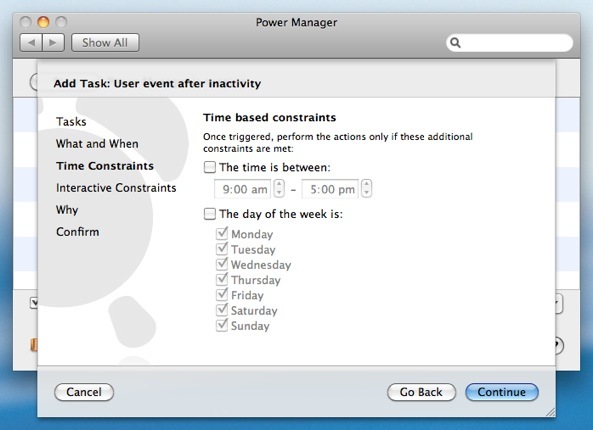 The Schedule Assistant includes a task to help create an event to automatically log out after inactivity. Choose the template "User event after inactivity". 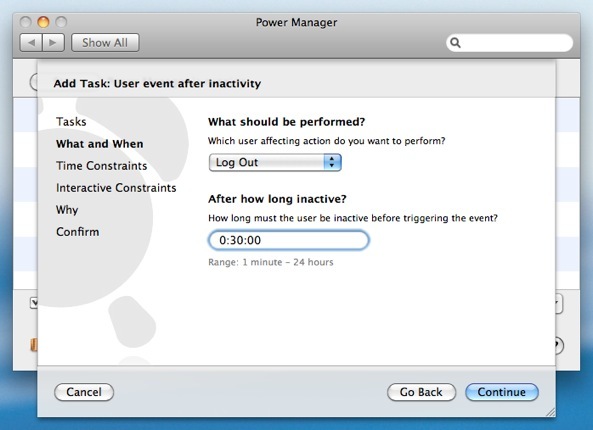 Choose the user event to perform after inactivity; select Log Out.You are not limited to logging out inactive users. You may prefer to switch back the Login Window, via the Fast User Switch option. Automatically logging out will quit all open applications and any unsaved changes in documents will be lost; be sure to remind your users to always save their work before leaving the Mac unattended. Automatically Fast User Switching returns the Mac to the Login Window. Any running applications and open documents are not affected. The previously logged in user, remains logged in but is now moved to the background. Enter the duration of inactivity required before logging out. Click "Continue" to move to the Time Constraints step.Your automatic log out event can be limited to performing only in particular situations. The Time Constraints and Interactive Constraints steps let you set up a range of event constraints. These constraints include limiting the days on which automatic log out can occur. The application is now scheduled and ready to perform after inactivity. 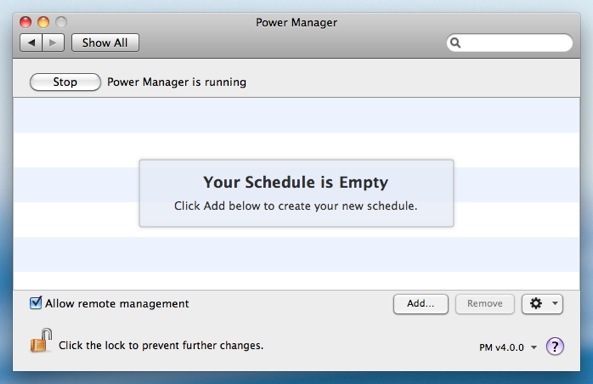 Power Manager will log out all users, including those that have Fast User Switched, after the period of inactivity. 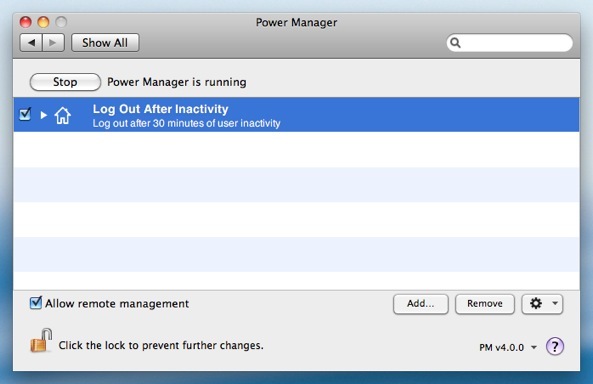 Power Manager's measure of inactivity is not the same as Mac OS X's idle time. Inactivity is the measure of time since the user last interacted with the computer. This article was posted in Energy saving, PM4, Power Manager, and Recipe and tagged dssw, how to, and Power Manager.